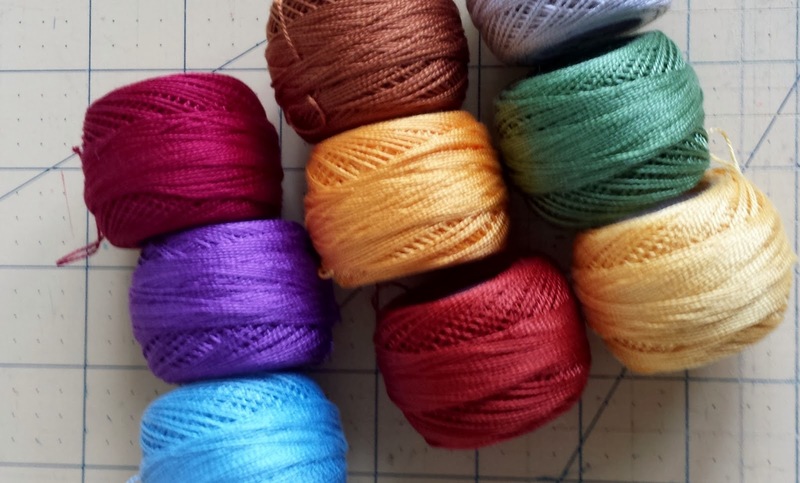 Quilting Rage: Baltimore At Last! 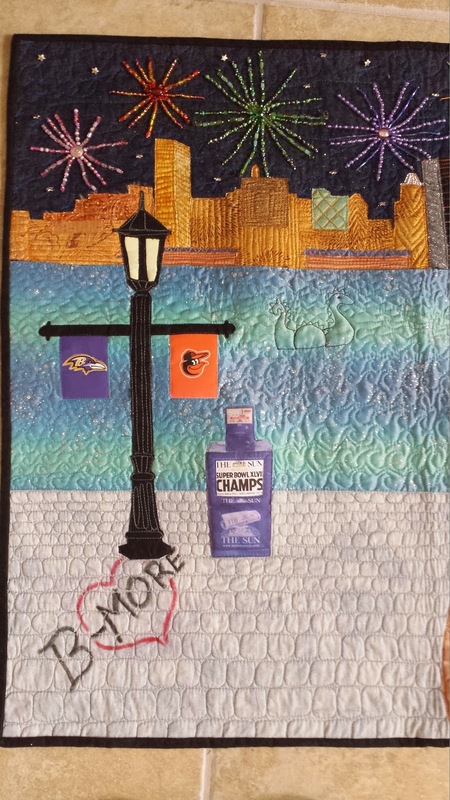 I am finally sharing my finished Baltimore quilt! It would have been here a few days earlier if I hadn't had computer issues. My husbands computer has never broken, by the way, it's always mine. I think it's a conspiracy! Here it is! All done! My good friend Joyce Ritter quilted it for me and I love it everything about it! The skyline is 100% accurate to the real Baltimore skyline (thanks to my hubby for helping me to print out the skyline and adjusting the size over a billion taped together pieces of paper till It was finally the right size for me to trace and use). The B-MORE graffiti was a last minute decision and not something I had planed on doing but I love it! I was able to find the newspaper clipping from when the Ravens won the superbowl last year and was able to put it into the Baltimore Sun newspaper box. I love these two! I love the beer, with real foam. The crab is even stuffed to give him more dimension. 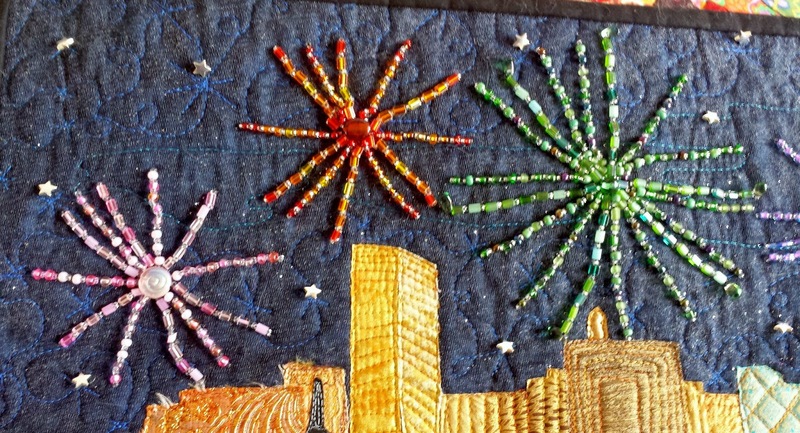 These firework where a lot of fun but also a lot of work! I also love the little silver stars. Since I went so long without posting I wanted to give you a few hints about the swap quilt that Im working on, that I still don't want to share until after the recipient has received it (or at least until it ships). 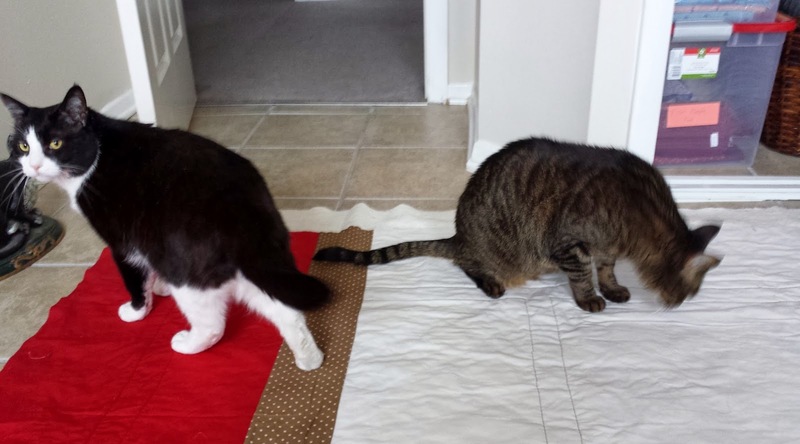 One of my friends tells me that her cats will not sit on a "ugly quilt. Friday and Zombie were fighting over who would get to sit on this quilt (this is the back of the quilt) after I laid it out on the floor this morning to snip some threads. That means it must be a beautiful quilt, right? I hope you love everything that is going on in my sewing room lately! Talk to you soon! I LOVE your Baltimore quilt. 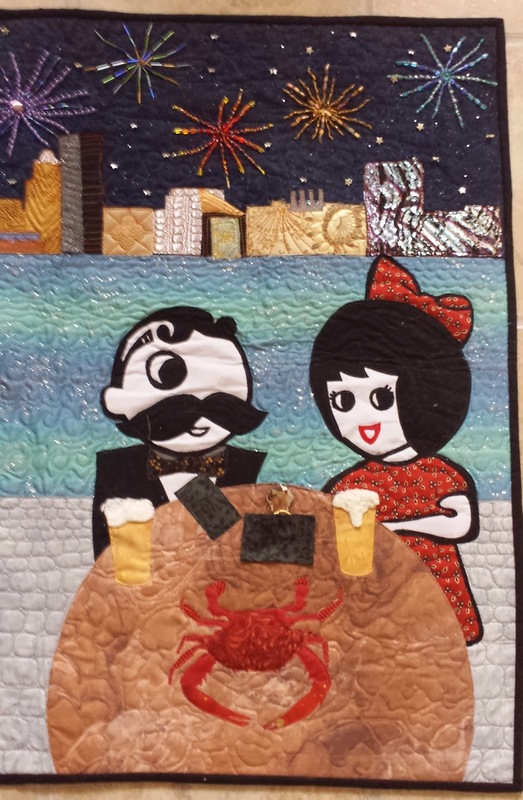 Having lived and worked in Baltimore, I can totally relate to all the elements - Natty Boh, Crab and the graffiti. Did you enter it in contest? It was made for a contest. Unfortunately my guild did not meet the minimum number of entries to enter. 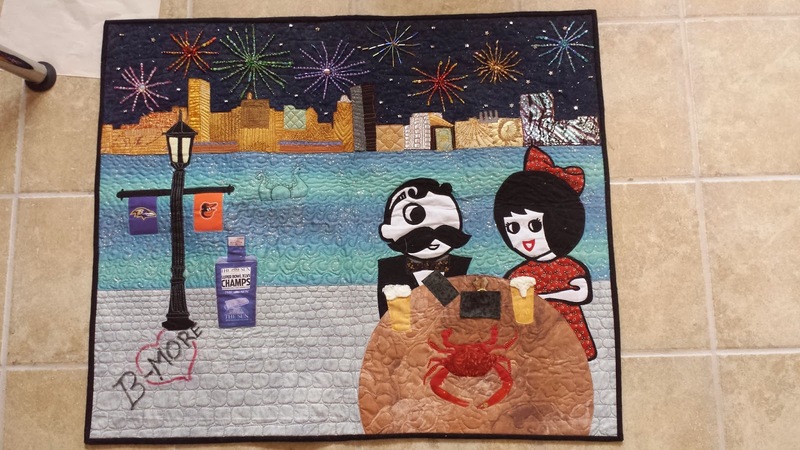 So, now I just have a beautiful Baltimore Quilt! My name is Athena. I live with my husband and three cats, Bacon, Friday, and Zombie. I am a quilter and love crafts in general!